BIONIC MAN Lewis Kerr insists he is lean and mean ahead of King’s Lynn’s season launch. Kerr successfully came through his competitive return to racing in the Speedway Riders Benevolent Fund event at Leicester – and he carded a race win. He’s also lined up for two individual meetings this weekend with Ben Barker’s testimonial at Redcar on Saturday and Sheffield’s 90th anniversary meeting the next day which also features Poultec Stars men Erik Riss and Kasper Andersen. All this just eight months after Kerr suffered serious leg injuries but he has worked overtime to be fitter than ever before. “All the hard work I put in since I crashed has paid off, it was real tough at times,” he said. “I am a lot lighter and fitter than last year, and I have had a lot of time to think and adjust things. 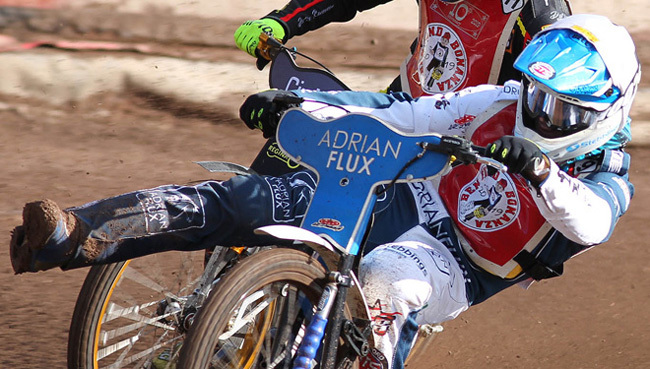 Kerr and his Poultec Stars colleagues will be together at the Adrian Flux Arena next Thursday, March 28, for the club’s press and practice session. “I’m looking forward to catching up with everyone, it should be a good day,” he said. “The team looks great and I’m really pleased to be a part of it all. Regional media will be on hand at 1pm next Thursday before the general public are admitted to watch track action at 4pm and the meet the riders event takes place in the clubhouse in the evening with admission by donation to the Speedway Riders Benevolent Fund. Poultec Stars launch their home season with the Premiership Shield against Poole on Monday April 8 but travel to Ipswich in the Supporters Cup on April 4.